She will always be the first lady of Star Trek to me. Rest in peace, Ms. Bettie. Stepfather’s father died today. 1917-2008 is a good long life. I am not nearly as sad about this as I was of Elbe’s passing, but still…could y’all just stop with the death thing already? More info to follow as I know. 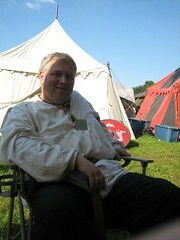 Not sure what this means for start of Pennsic. May mean nothing as it may just be immediate family (of which I may not be counted). Totally not sure. Not even sure *where* (possibly Cinci). My husband, Elbert Cheek V, also known as Master Osric Cumbra, Order of the Laurel, died Saturday, July 12, 2008 of a massive sudden heart attack. I will announce funeral arrangements after I have made them on Monday morning. Please keep our family in your thoughts and prayers. Osric loved many of you more than he could ever say. And get your annual physical. Osric did, but this crept up on him quickly. Stay healthy, everyone, there are far too many people counting on all of us. You are currently browsing entries tagged with death at More Than Just the Food.